Summer Mini goes live today! 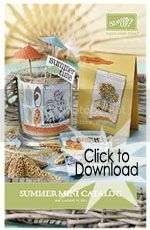 The Summer Mini Catalog starts today!!! It is good from Sunday, May 1, 2011 until Wednesday, August 31, 2011. Check out all the new and exciting things Stampin' Up! has come out with in this new "Summer Mini Catalog". This is the first time I have done this - put a picture on in another way other then by using the add a photo button on this website.